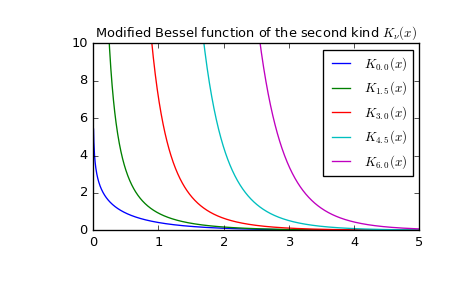 Returns the modified Bessel function of the second kind for real order v at complex z.
as \(x \to \infty\) [R415]. The results. Note that input must be of complex type to get complex output, e.g. kv(3, -2+0j) instead of kv(3, -2). Wrapper for AMOS [R413] routine zbesk. For a discussion of the algorithm used, see [R414] and the references therein.